Since the 90cm wide slalom boards are listed in the official lists of registered board by ISAF/IFCA and PWA, this new class can and will be a good option for all heavier racers racing in competitions close to the lower wind limit. But also for sailors doing Free-Racing this board class may be the best compromise between Slalom and Formula boards for the 9-16 knt wind range. The actual boards are showing an excellent overall performance on all courses between upwind and downwind including crosswind. This is a real difference to Formula boards that are mainly designed for downwind and upwind courses. In end of 2013 we added the F_1-SL to our portfolio. The fin is based on the successful F_1 Formula fin but got a different carbon layup to fulfill the requirements of the new board class. The F_1-SL has very high torsion stiffness and super³-soft bending stiffness generating sufficient vertical lift to de-load the board and reducing the surface friction drag between board and water. The board gets a very stable planning position and can be fully sailed on the rail and fin. We designed the carbon layup orientation and geometric twist in a way that the fin still allows very good control in the upper wind range. The F_1-SL is produced with high-end carbon types like IMS65 and TeXtreme. 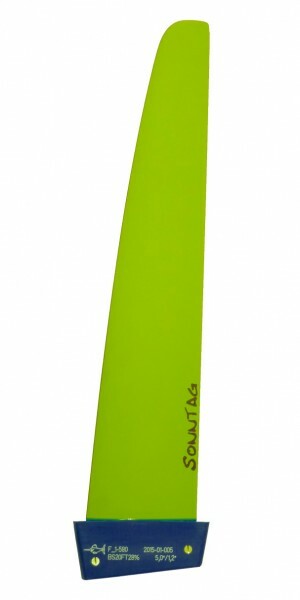 These materials are the base for long-term performance and soft but durable fins. Available in length of 56 to 63cm in DT.